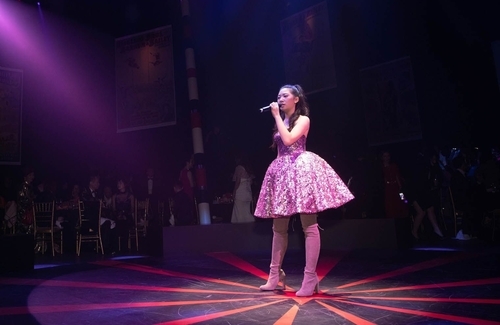 On December 8, the Hong Kong Academy for Performing Arts held its annual Academy Ball to raise funds for scholarships. Over 350 people attended the event including Donnie Yen (甄子丹), his wife Cissy Wang (汪詩詩), his daughter Jasmine Yen (甄濟如), and son James Yen (甄濟嘉). Jasmine and James were not just attendees – they took to the stage to perform “Rewrite the Stars,” a song from the movie, The Greatest Showman, to go with this year’s circus theme. Soon-to-be 11 years old James played the piano to accompany his sister’s vocals. Although it was his first public performance, he appeared calm. James’ musical talent comes as no surprise since Donnie is also a master on the piano, having achieved the Grade 8 piano level. In fact, Donnie came from a family of musicians. His father was a violinist and his mother was a soprano, thus, he learned how to play musical instruments from his parents early on in life. It also explains why 14-year-old Jasmine can sing so well, generating the most attention on stage. Her performance caught the eye of famous Mainland singer Tan Jing (譚晶), who deeply praised her singing. Models Kathy Chow (周汶錡) and Qi Qi (琦琦) were also enthusiastically clapping for the children. Aside from their talent, Jasmine’s performance also put her appearance in the spotlight. She notably resembles her mother Cissy as they are both tall and around the same height. She also has a sweet look, and her face is similar to her mom’s.